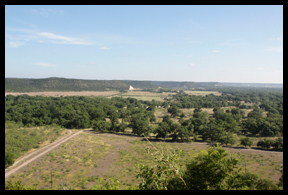 The scenic overlook is a 1.2 mile round-trip hike from the walk-in camping area at South Llano River State Park. The path is actually a one lane paved road to the top. The original intent was to allow vehicles to drive up to the scenic overlook, however, once completed it was discovered that the road itself was not built wide enough to allow traffic in both directions, and with no safe pull-outs the decision was made to open to pedestrian traffic only. Part of the walk up requires navigating a fairly steep grade. The ascent is approximately 500 feet. As with any walk or hike in Texas, head to the trail-head early, in the cool of the morning, and be sure to carry water. You will be rewarded at the top with expansive views of the Walter Buck Wildlife Management Area. 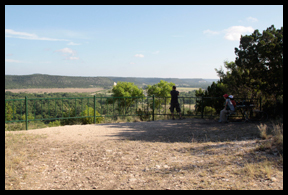 A picnic table is strategically situated to take in the lovely view of Texas Hill Country. If you are visiting the park for the day only the day-use fee is $3 per adult or waived if you are the holder of an annual Texas State Parks Pass. Day use permits expire at 10PM. 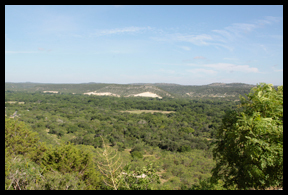 South Llano River State Park is located at 1927 Park Road 73, approximately 6 miles outside of the town of Junction, Texas. This entry was posted in State Parks, Texas, Things to do in Texas, Uncategorized and tagged hike to scenic overlook at South Llano River State Park, scenic overlook near Junction Texas, South Llano River State Park, Texas Hill Country hike, Walter Buck Wildlife Management Area. Bookmark the permalink.